I have a small wooden window factory and have been purchasing my poplar stock from a saw mill with a double sided helical planer. They let me cut my wood to length then joint/plane it for flatter boards. However, even when the Extrema planer is tuned in with fresh carbide the wood has “micro voids” and needs sanded or finished again. After much experimentation I’ve found my little Dewalt 735 cleans the surface nicely, with no further attention needed before priming/staining. BUT, it’s a hobbyist tool and the motor overloads during long runs. I need a stationary planer that gives the same finish as the Dewalt but is much more rugged. Also, I LOVE the easy with which I can change the blades in the Dewalt. So, since I can’t get the Dewalt 735 with 7.5hp 3ph I need to find the next best thing. I’m looking for a stationary planer with a) straight, quick change blades b) a smooth finish c) plenty of power. Is the Jet JWP-15DX 15” 3-hp Planer the only one on the market with quick change knives like the bench-tops? Can ANY helical give the same quality cut as a a good straight knife planer? I also currently have a 735 and I agree, it does one seriously fantastic job of making wood smooth. That said, I always sand mine before I apply the finish. Given the rave reviews of the Byrd Shelix helical cutter heads I doubt those leave voids. I am fixing to upgrade to a bigger more heavy duty planer very soon, but not positive yet which one. Based on what I have read and heard it will probably be one with a Shelix head. They make the Shelix for the 735, but it costs as much as the planer and you are correct, it really isn’t a heavy duty machine. I have not seen any HH give as nice if finish as a straight knifes. I have noticed the same thing on soft woods.And sometime go back to my jointer and take a very lite pass. I’m anti sanding. 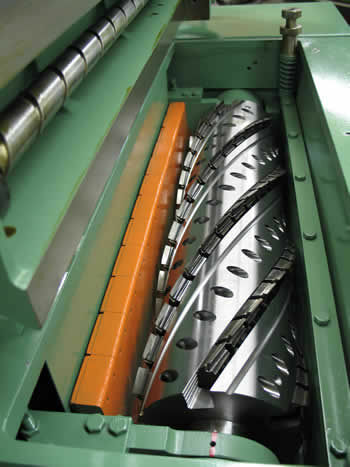 Does your planer head look like this? William Ng has a great video on sharpening knives for a smooth finish. May you have continued success going forward.